Flood disasters, once seen as merely once-a-century events, are becoming more and more common. Experts agree that urgent action is required, because flood damage already tops the European and American loss statistics. Some of the losses are foreseeable and can often be prevented by well-thought-out flood protection schemes tailored to local needs. For thousands of years, people have preferred settlements alongside rivers and coasts. River courses have been straightened and constricted, floodplains – the natural routes and holding basins for floodwaters – have been reclaimed and built on, forests have been felled and the air polluted. The consequences of these serious interventions are global climate change and more and more environmental disasters. Flood levels that normally occur only once in every century are becoming more frequent. The exception is almost becoming the rule. Flood protection is therefore one of the most important preventive measures for the urban and rural communities at risk. This is because alongside the human tragedies and economic losses, flooding often leads to the breakdown of the central services on which the local inhabitants and their helpers rely in just such emergencies. Flood protection is a matter of trust, ThyssenKrupp Infrastructure is a world-renowned supplier of flood protection technology, and Prairie Supply Inc is a national distributor. We can supply a wide range of high-qualityproducts and diverse technical services for hydraulic engineering and water management projects. Our Engineering team and partners are very familiar with the US Army Corps of Engineers EM manuals for Retaining and Flood wall design, Closure Structures and Hydraulic Steel and Aluminum Structures design. Our Closures are complying with the FEMA technical requirements for an easy process of evaluation and complete project certification. ​Prairie Supply inc. is a national distributor of TKR flood protection. Prairie Supply inc. can service flood wall, and temporary flood control projects in. North Dakota, Montana, Minnesota, South Dakota, Iowa, Nebraska, Kansas, Missouri, Wisconsin, Illinois and more. Inner-city areas, ports and industrial districts, road and rail crossings are just a few examples of places where permanent structures are often a hindrance because they restrict visibility and the movement of traffic. 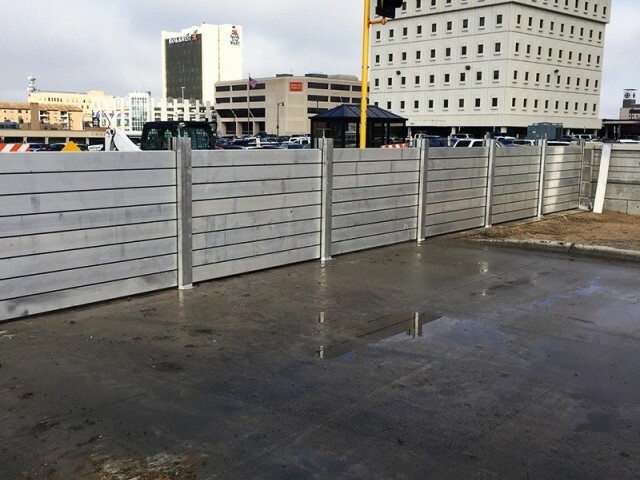 If flooding occurs only occasionally in such places, our demountable flood protection systems can be used instead of the more elaborate, more costly permanent solutions. 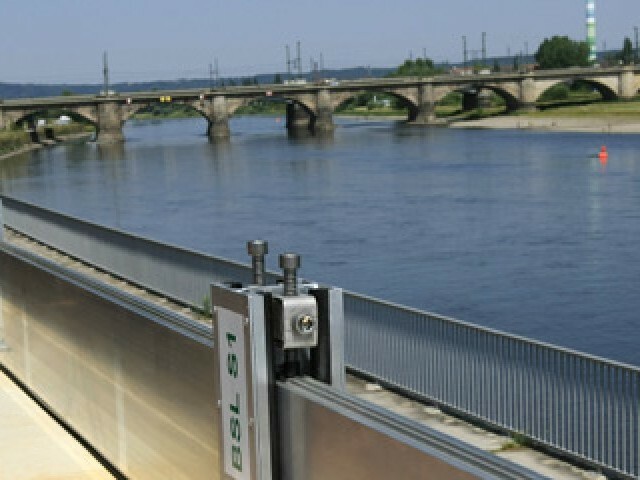 Depending on local conditions and flood situation, temporary aluminum systems are used which protect the dike up to a height of 2.40 m above the dike top. The retrofittable elements consist of aluminum supports with a 10% incline as well as intermediate beams which can be braced against one another horizontally and vertically. The aluminum profiles are easy to handle and install, require little storage space and offer high stability and tightness. The aluminum stop log system consists of only a few standard parts and can be used as a protective wall, for dike openings and for building protection. The logs and supports are made from aluminum profiles. Vertical bracing of the logs is by means of wedges made of impact-resistant plastic, while horizontal bracing is by means of screw lock units. Special purpose-designed seals of EPDM material ensure the tightness of the system. The EPDM material is weathering-resistant, robust and resistant to aggressive chemicals. Strip foundations, sheet walls, piles or other suitable foundations can be used. Loads are transferred into the foundations via anchor plates and stainless steel bolts. For direct mounting on steel sheet pile walls, special connecting structures are available. 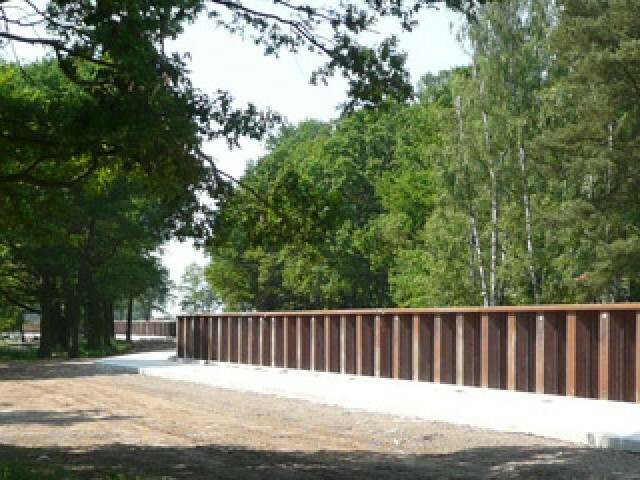 Our fold-up flood protection system is used as a complement to steel sheet pile walls to temporarily raise the flood line or close off roads. The advantage is that it is already located directly on-site and is ready for use immediately. Stop panels are fabricated from stop logs and are inserted into the support structure as a complete wall panel and then braced for sealing. They are also suitable as inspection closures for locks, weirs and inlets. Stop panels can also take the form of large-area walls of aluminum or steel and are brought from their storage position into their protection position with the lifting gear provided. Larger surface areas can thus be assembled quickly and with little effort. Stop panels are preferably stored in the direct vicinity or integrated directly in the flood protection system. Smaller stop panel systems, which are usually installed manually, are available in various designs for doors, windows and gateways. The panels are manufactured individually for a particular opening. The materials used are steel or aluminum with various corrosion protection and design possibilities. In addition to manual operation, electric or hydraulic operators can also be supplied. Door type, design and outer appearance are selected on a project to project basis, allowing us to exactly meet our clients’ needs and wishes. Natural protection against the risks of flooding is seldom adequate. Therefore, diverse permanent civil engineering measures, e.g. dikes, reinforced banks, walls, water retention basins and the raising of dikes and banks, have been implemented over the years. These permanent flood protection systems are fixed parts of the infrastructure. They have a permanent effect on the appearance of landscapes and townscapes. The enormous costs of such major projects call for convincing proof of their reliability, but primarily economically justifiable planning concepts. Owing to their cost-effectiveness and versatility, steel sheet piles from ThyssenKrupp Bautechnik have proved to be an ideal answer in many projects worldwide. 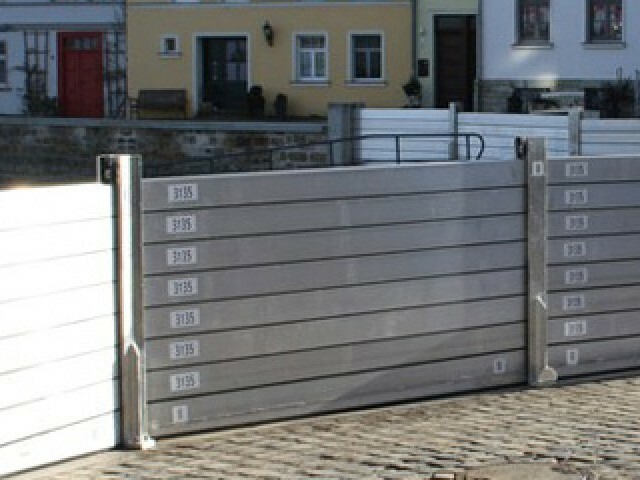 When floods threaten, a modular dike-top system consisting of four sheet pile sections, a U profile and seals are placed onto a beam on the sheet pile wall and connected with locking devices. This simple and water-tight structure, which can be extended horizontally for any distance, can be used to raise the dike top by around 1.00 m.
Break-proof glass walls are an aesthetic and elegant flood protection solution. Laminated safety glass panels held by aluminum supports are fastened on the existing sheet piling sections. In this way, ideal protection can be achieved for threatened central areas without altering the landscape. The prefabricated dike-top systems made of steel sheet piling guarantee fast and reliable installation and are a low-cost system solution.